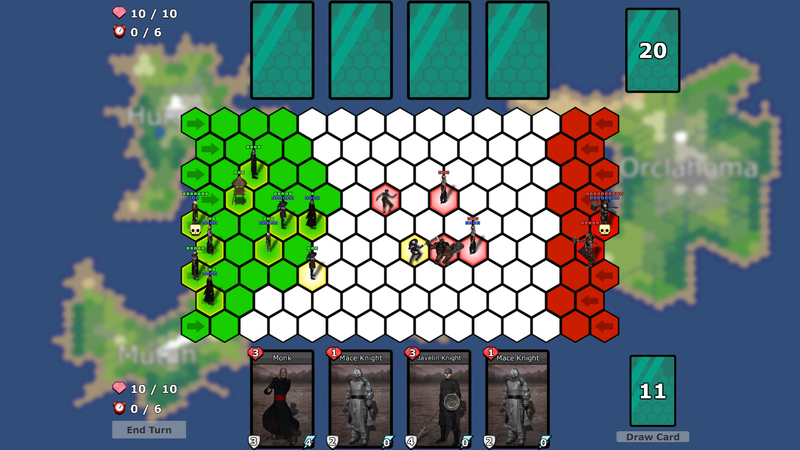 This is a turn based Strategy Game where collectible cards are used to summon units. Like in chess it's your main goal to destroy the enemy king and to protect your own. You can spawn different units with different attacks and spells to help you with your task. Defeat all kings of all other kingdoms to make your empire grow. I added a Mirror for the Windows Version on Dropbox, since my Server is rather slow. I also uploaded a Mac Version, for the case that someone needs it. It was a way too big Project to do it by myself while working a fulltime Job. It's done but it's not as I wanted it to be. I planned more Levels, more Cards, better AI, Animations (oh yes, there are no animations), a Story (Actually I made up a whole story in my had but I wasn't able to add it to the Game) and all kinds of stuff but I'm happy that I produced a playable game, even though I started two weeks late. I hope you guys have fun with it anyways. I didn't do all the work to not submit it here. Have a nice day, Everyone; And if you participate as well, good luck!